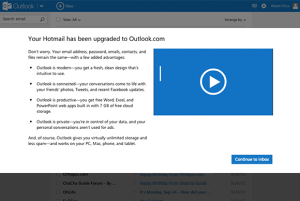 Hotmail users will be getting a new outlook on email before long. Late Monday, Microsoft announced that the preview phase for Outlook.com, the software giant's new and improved Webmail service, is over after being used by more than 60 million people in its six months of existence. Now that's it's ready for prime time, Microsoft plans to migrate current Hotmail users over to the new interface by the time summer rolls around. Fear not; the transition shouldn't be too painful, as your mail, contacts, and current account settings will come along for the ride. There’s a lot to love about the Outlook.com migration if you’re a Hotmail user. First of all, you get a Webmail service with a clean, modern interface that is much easier on the eyes than the crowded 90’s-style look of Hotmail. Microsoft’s new Webmail service also integrates with Facebook, Twitter, and LinkedIn so you can see social updates from your contacts right in your e-mail window. If you already integrated these accounts with Windows Live, these settings should also come with you. Outlook.com includes some of the handy tools Microsoft integrated into Hotmail, including ‘Sweep’ and ‘categories’ for better message handling. The new service also integrates with other newly revamped online services from Microsoft, including SkyDrive and People, though regrettably, Calendar has not yet been overhauled. Microsoft says you’ll also see 60 percent fewer ads on Outlook.com than on Hotmail thanks to social updates and messaging panes that take over space usually occupied by advertisements. If you want to beat Microsoft to the punch, you can migrate automatically by just signing in with your Hotmail account at Outlook.com. You can also check out our earlier hands-on tour of Outlook.com to get the full details on how to navigate the service. Should you rename your account or create an alias? A new Webmail service also means new beginnings, and what better way to do that than changing your old, dated Hotmail address to a sparkly new Outlook.com e-mail? Microsoft offers the option of changing your Hotmail e-mail to an Outlook.com address—though you may not want to do so if you’re using a Windows Phone, a Windows 8 PC, or an Xbox. If your Hotmail address doubles as your primary Microsoft account and you use it to sign in to your devices, renaming your email with an Outlook.com domain will require you to reconfigure your devices to log in to the new account rather than the old Hotmail.com address. Windows Phone users will need to perform a factory reset on their handsets to do that, which will wipe all the apps and personal data from the phone. You can freely reinstall the wiped apps, but the personal data will be gone forever if you don't back it up first. A better alternative is to just change your e-mail address using an alias. Outlook, like Hotmail before it, allows you to set-up alternative e-mail addresses called aliases that can deliver e-mail to the same inbox as your primary account. The beauty of this approach is that you can use your alias as your default address and still receive e-mail sent to your old address. And, if you ever get tired of your new Outlook.com alias, you can just trade it in for a new one without much hassle. The downside is that your aliases can’t be used from a smartphone app or a mail client like Windows Mail. In these situations, you will only be able to send mail from your primary Hotmail address. You can create five new aliases per year up to a maximum of 15 aliases. 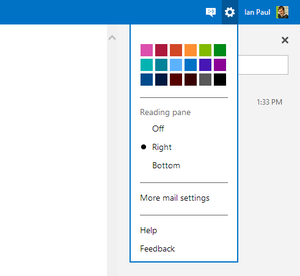 To get started, login to Outlook.com and click on the settings cog on the upper right side of your inbox screen. Then, in the dropdown window, select “More mail settings.” On the next screen, select “Create an Outlook alias” under the “Managing your account” heading. Now you’ve got your new e-mail address, but you need to tell Outlook to automatically send new mail from this address by default. Go back to you settings cog and select “More mail settings” again. Go back to the “Managing your account” heading and select “Your email accounts.” On the next page, scroll all the way to the bottom and under the “Default ‘From’ address” heading, select your new alias from the drop down menu. That’s it, you’re done. Now, all e-mails you send from Outlook.com will come automatically from your new address.